With the emergence of business management software, it becomes difficult for business owners and entrepreneurs to choose the one that is best suited to their business needs. However, the best way to choose the right software for your business is to know what you need. Once you know what your requirements are, the next step will be to sort the software that qualifies the best with your needs. Sage 50 Hosting is the cloud accounting software that offers anytime, anywhere access, along with other features of the cloud. Sage 50 Desktop, on the other hand, is an accounting and business management software, especially designed and easy-to-use for businesses of small and medium size. The desktop version, however, is also scalable to suit the needs of large enterprises as well. When a business moves to the cloud, the biggest worry the owner experiences is the safety of his data. Since data on the cloud is handled by a third-party, the worries are genuine. But Cloud Hosted Sage 50 ME has these worries sorted with a secure firewall installed, an up and running anti-virus program, third-party audits, on-premise security guards and data encryption. Any data that is stored on the cloud can be accessed anytime, from anywhere, and on any device just with a working internet connection. A business owner using Sage 50 on the Cloud Hosting can also share access to the business files with his clients and employees if needed. As the point above explains, the owner of a particular set of data can share the access to the files with the people he trusts. This is done in view of having an uninterrupted, collaborative workflow. There are instances when the owner may be traveling for business or the client may be residing somewhere far-off. In situations like these, not everyone can be present at the local office. Thus, Sage 50 on the Cloud presents itself as a savior. With the desktop version, Sage 50 users have to spend several bucks on up gradation whenever an update happens. 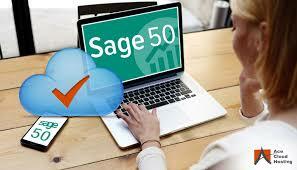 With Sage 50 on the cloud, however, the updates are done by the Sage 50 Hosting Provider. What do you do in case your local computer is down? Wear and tears are common and your computer may break down for ‘n’ number of reasons. When this happens, productivity suffers. This is where the cloud-hosted Sage 50 comes. Your files and business data can be accessed from any computer, only if you have an internet connection. Improved collaboration, less or no downtime, upgraded software, and less spending directly implies better productivity. No files are lost, data is always backed up, and protection from man-made and natural disasters is ensured. Files can be exported to excel, converted to pdf, changes can be made, and information can be updated, without any loss of functionality or unwanted delays. Sage 50 Cloud Hosting can be integrated with an array of useful software and tools to make work easier, quicker and more productive. Applications like Microsoft Excel, MS Office 365, Skype, and Microsoft PowerPoint are all integrated with cloud-based Sage 50 by default. When You Need To Upgrade Sage 50 ME In The UAE?